Atkins Induction means goodbye to carb-rich side dishes such as rice or potatoes. Instead, you can have vegetables – up to 20g of net carbs a day. As vegetables are the main source of permitted carbs, you might actually eat more of them on Atkins than before. If you are one of these people who never used to eat anything green, here are some tips on cooking Atkins Induction vegetables. The list of permitted vegetables and corresponding carb counts are from Phase 1 page on Atkins website. Salad is not difficult to make! Just chop up any vegetables listed below in any combination. Salads are the best way to retain all vitamins and nutrients in vegetables. Cooking destroys some of them, so opt for fresh vegetables whenever you can. Dressing is the key to making any salad taste nice – for the simplest dressing, combine 1 part oil (preferably olive) with 1 part wine vinegar. Make your own salad dressings while on Induction, as shop-bought versions might be laden with carbs. New Atkins for New You book has a huge section on dressings and sauces recipes. You can steam-cook vegetables by placing them on top of a pan of boiling water, in a colander or a steamer. The taste is similar to boiled vegetables, but veggies don’t get soggy or watery. I recommend getting a steamer – you can definitely use it a lot while on Atkins. 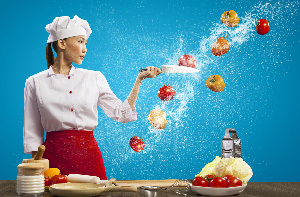 Alternatively, just use a colander or a sieve to hold your vegetables on top of the boiling water. Dress steamed veg with butter (20g / 0.6oz would usually be enough) and/or grated cheese (15g / 0.5 oz). Sautéing is a fancy name for pan-frying on high heat using a small amount of fat – either oil or butter. Chop and fry gently in a pan with a some butter (10-15g, 0.3-0.5oz) or 1 tbsp of oil, on medium to high heat. Use a wide, shallow pan and turn the veg over several times. Stir-fry is similar to sautéing, but done over very high heat, and with constant stirring of the veg to avoid burning them. You can add thin strips of meat, poultry or seafood into the same pan, and cook together with the vegetables. Don’t use butter for this method, as it will burn. Use a vegetable oil with a high smoking point, like coconut, peanut or canola. Cut your ingredients into very thing strips. Cook quickly in a wok or a large frying pan, turning constantly. Boiling is a simple method that works well for green vegetables. Just boil some water and chuck in the veg. Take care not to overboil the veg, as it might become soggy and boring. Roasting is the slowest method for cooking vegetables, but it produces very nice tasting results. Slice the vegetables, brush with oil and season with salt and pepper. Roast for 20-40 minutes at 190C/375F/Gas Mark 5. Some vegetables don’t need any cooking at all. Just munch them raw as they are. Are you currently on Atkins Induction? 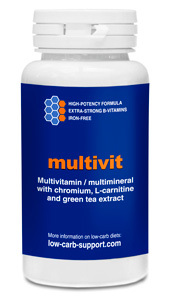 Check out Nutri-Align Multivit – multivitamin formula designed to make your low-carb diet easier. Perfect supplement to support Atkins Induction!